You are here: Home / News/Events / Events / Benefit Concert – Special Guest!! Declan O’Rourke to perform at our Benefit Concert in Claregalway Hotel this Saturday night. Fresh from the launch of his new album ‘In Full Colour’ and in the middle of a nationwide tour, singer-songwriter Declan O’Rourke will perform with a line-up of well know fellow Irish musicians in the Claregalway Hotel this Saturday Night, 19th November. The night promises to be a sell-out event with the legendary Kilfenora Ceili Band, trad/folk singers Matt Keane, Don Stiffe, Dessie O’Halloran and the renowned John Faulkner, all taking to the stage to play an array of their well-known and much loved traditional and folk songs. The night will also see performances by the Inishbofin Ceili Band, Clare musician Conor McCarthy, Johnny O’Halloran, Annette Roland, Galway girl Yvonne Flynn, James Clenaghan and a Sean No’s Dance display. This event is a must for anyone who is a fan of trad/folk music and a fantastic opportunity to see so many accomplished musicians perform on the same night. 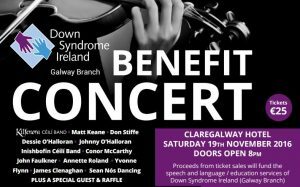 Tickets are favourably priced at €25 pp and can be purchased from the Claregalway Hotel 091 738300 and from Down Syndrome Galway, online @ www.downsyndromegalway.ie or contact 087 6448277. Doors open at 8pm, a limited amount of tickets will be available at the door on the night, however it is advised to purchase in advance to avoid disappointment.